3D content is supported when a 3D-capable display and 3D source are connected. DVI-D is also supported when used with HDMI to DVI adapters, providing greater flexibility and options when integrating several different commercial displays. 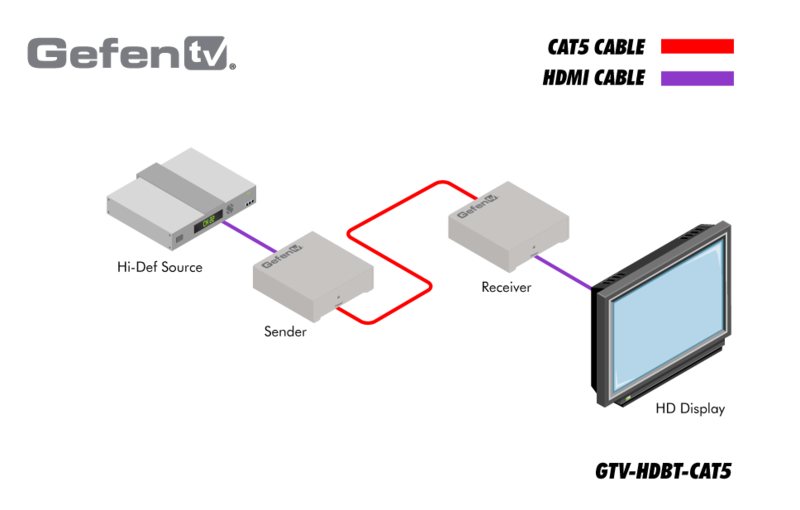 The GTV-HDBT-CAT5 Extender features Gefen's ELR implementation of HDBaseT Lite technology. Its uncompressed digital transmission method insures 100% signal integrity. The use of standard CAT-5e cable makes HDMI signal extension easier to install within a room or through walls. The GefenTV GTV-HDBT-CAT5 Extender for HDMI over one CAT5 consists of a Sender and a Receiver unit. The HDMI source (such as a set-top box, Blu-ray player, or game console) connects to the Sender unit with the supplied 6 foot HDMI cable. The Receiver unit connects to the HDTV display using another HDMI cable, up to 230 feet (70 meters) away. One CAT-5e or CAT-6A cable links the Sender to the Receiver unit. Power is applied to the Sender and the Receiver with the two included 5V DC power supplies. A crisp, flawless High-Def picture appears on the HDTV display.